Home > Insurance Blog > Summer Rental Insurance? It’s not only humans who benefit from the boom in home technology. As a recent article from RISMedia suggests, pets are reaping the rewards, too. Smart thermostats allow homeowners to monitor temperature in each room and adjust for weather conditions from their smartphones or tablets. This can be a lifesaver for pets, who often suffer when owners are away and temperatures dip or rise drastically. Owners also can control remotely when their pet’s food will be dispensed, and even be notified if supplies are running low. And for owners who have to leave their dogs alone for the day, there are “smart doggy doors” that use radio frequencies to communicate with a tag on the dog’s collar and let puppy in and out. These days, it truly is a dog’s world! Along with nice weather, summer brings together two important pastimes: grilling and baseball. These popular activities share a common culinary theme: hot dogs. Enjoyed in thousands of backyards each year, and by sports fans in stadiums across the country, the hot dog has become a summer staple. But where did the idea originate to grill a tube of meat, insert it in a bun, and load it with toppings? In fact, both Austrians and Germans lay claim to the honor. Germans claim the “frankfurter” was created in Frankfurt, where Germans made thick, fatty sausages and coined the term “franks.” But the Viennese point out that the name given to the first hot dogs was “wienerwurst.” In the Austrian language (which is slightly different from standard German), “Wein” means Vienna, and “wurst” means sausage, so clearly they were Austrian sausages first! Either way, we can thank German immigrants for bringing their native sausages with them to the New World, where they first sold hot dogs from pushcarts in New York City in the 1860s. Some stories claim the bun (or roll) was added simply so customers wouldn’t burn their hands on the hot sausages. 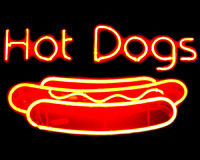 As for the moniker “hot dog,” legend has it the term was coined in 1902 at a New York Giants baseball game. The cold weather prompted one vendor to switch from supplying ice cream and sodas to hot sausages as a particularly apropos alternative. The call went out: “Get your dachshund sausages, red hot!” and the hot “dog” was born. Summer Rental Insurance: Yours, Theirs or Both? It’s summer! Some families spend their summer holidays at a luxury resort, while others stake a tent in the woods. And then there’s the increasingly popular option of renting a vacation home. This home-away-from-home getaway can provide a great setting for creating family memories – as long as you ensure you have the insurance coverage you need, because this responsibility rests with both the renter and the homeowner. Liability: If you accidentally damage someone else’s property, your policy will help pay for the damage. So if the kids’ indoor soccer game gets out of hand, you’re covered. Personal property: Your homeowners policy will protect your personal belongings, even away from home. However, coverage limits may be lower in this case. Additionally, recreational equipment such as boats usually requires a separate policy. Consult with your agent to ensure you have the coverage you need. Proper insurance for them: The owner of the rental property should have proper coverage for the home. Be sure to verify that the owner has a homeowners policy with appropriate liability coverage, in case anyone is injured on the property as a result of owner negligence. The owner’s homeowners policy should also cover any damage to the home that occurs from natural disasters.